Having diabetes should never hold you back from doing the things you love or taking adventures. However, when it comes to traveling, especially when going to places far off the beaten path, managing all the details of your diabetes care may seem overwhelming. You may be concerned about simply getting your supplies onto the airplane, not to mention time zones changes, new climates or how to follow your meal plan while away from home. However with a little planning, many obstacles can be overcome. Here are some tips to help make your traveling as stress-free as possible. If you’re traveling by plane, you may encounter a few hassles at the airport especially going through security. Wearing a medical alert bracelet and showing it to security personnel is a good first step toward explaining why you are carrying medicines and diabetes supplies. A letter from your doctor stating the date, your name, your diagnosis and a list of all of the supplies (blood glucose meter, strips, lancets, etc.) and medicines you use may also smooth your way through security. 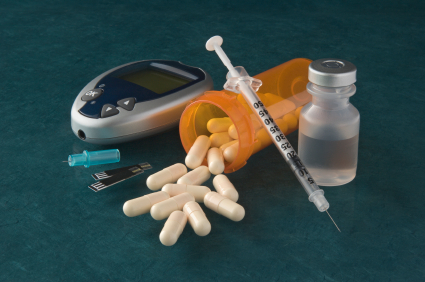 If you use insulin, make sure that the type of insulin and dosage as well as the supplies you need for administrating it are listed. This list might include insulin pen, needles, syringes and if you wear an insulin pump you should make a list of those supplies as well. All of your supplies should go in a carry-on bag and not in cargo with the other checked luggage. Besides the fear of lost luggage, the cargo area has extreme temperatures that will degrade your insulin. “Make sure that your insulin, in any form or dispenser, is accompanied by a professionally printed pharmaceutical label that identifies it. Since the prescription label is usually on the outside of the box containing vials of insulin or pens, it is recommended that passengers refrain from discarding their insulin box and come prepared with their insulin in its original, pharmaceutically labeled box. For passengers who monitor their blood glucose levels but do not require insulin, boarding with lancets is acceptable as long as the lancets are capped, and as long as the lancets are brought on board with a blood glucose meter. For more information you can contact the TSA and Federal Aviation Administration (FAA). You can also contact your airline carrier. If you are carrying insulin it is recommended that you keep it cold whenever possible. Transporting it in an insulted carrier with an ice pack and then transferring it to a refrigerator is recommended. Most hotels can accommodate a refrigerator in your room if you request it in advance. Some travel guides recommend taking twice the amount of supplies that you would normally need for your trip to allow for unexpected problems and delays. When carrying oral medications, it is often easier to carry the original prescription bottles rather than counting out the number of pills that you will need. You may also want to bring extra batteries for your glucose meter. Like many things in life, travel tends to get easier with experience. Besides the above tips you can also talk to your diabetes health care team and ask your friends with diabetes about their experiences. Great travel tips, Kathy. It’s so important to prepare before you travel to make sure all your bases are covered – including not getting your medications confiscated by TSA!